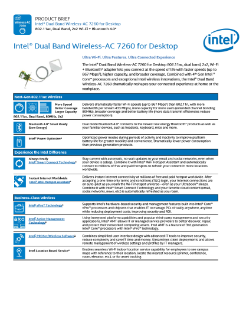 The Intel® Dual Band Wireless-AC 7260 for Desktop 802.11ac, dual band, 2x2 Wi-Fi + Bluetooth* adapter lets you connect at the speed of life with faster speeds (up to 867 Mbps), higher capacity, and broader coverage. Combined with 4th gen Intel® Core™ processors and exceptional Intel® wireless innovations, the Intel® Dual Band ...Wireless-AC 7260 dramatically reshapes your connected experience at home or the workplace. See why you need Intel® Wireless-AC for smoother high-resolution streaming, faster downloads, and compatibility. Descubra lo fácil que es añadir una potente Wi-Fi a su equipo de sobremesa con el kit Intel® Dual Band Wireless-AC 8265 para equipos de sobremesa. Accelerate performance for gaming, streaming, downloading, and more with gigabit Wi-Fi connectivity.